In Search of a Fallen Currahee. My story is very much like those you would read from others remembering their lost buddies. 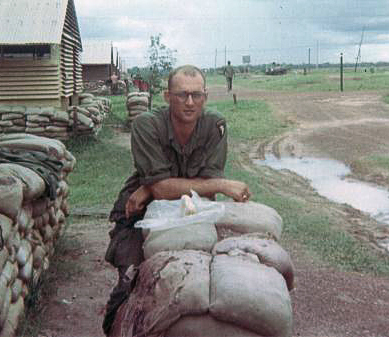 I was a replacement in C Co., 1/506th Infantry in July of 1968 and was transported out to a post just outside Phuoc Vinh in the III-Corps area of Vietnam, and from there to my unit out in the field. 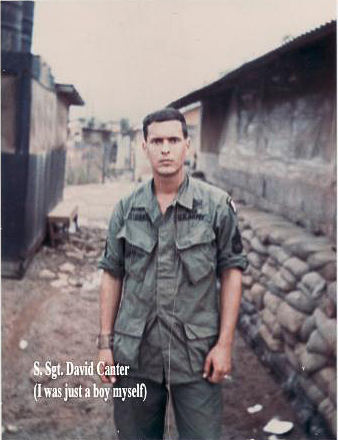 I was assigned as Platoon Sergeant in the 1st Platoon and given an R.T.O. to help me stay connected to the other leaders in Charlie Co. Sgt. Lyle Schroeder was assigned as my R.T.O. and soon we were friends and confidants. We dug our foxhole together every night and spent much of our time together as we marked off the days of our tour in the 'Big Green Latrine.‛ We talked about life 'back in the world‛ and he knew about my classic 1966 Mustang and the girls I wrote to back in the world, and I knew of his relationships back home, especially with his two daughters whom he missed terribly. I slept in the jungles and rice paddies at night trusting that he was watching over me and he did the same. In the fall of 1968 we were reassigned to join the balance of our division in I Corps. We spent most of the time at first out near the South China Sea in an area of sand dunes and rolling hills full of booby traps. In one span of about 30 days we lost over 30 men to booby traps, never contacting any enemy units nor firing the first shot. It was a time of extreme frustration. Not long after this we came inland and continued our day-to-day search-and-destroy missions in a slightly more hilly region, although still riddled with landmines and boobytraps. On January 26, 1969 Lyle got up early in the morning and left the perimeter, only to trip a deadly boobytrap. He was gone in just a couple of moments. I was by his side as his life ebbed away; a dreadful feeling of loss and regret entered my life as I thought about the choices made that led to him being at that exact spot at that exact moment, ultimately ending with his death. We had lost other Currahees, but Lyle was a close friend, a valiant soldier and man of integrity. We had to place his remains in a body-bag and send all of his gear with him, so I never knew how to contact his family, and quite honestly, didn’t know what I could say if I did. He had shown me the ropes when I first came 'in country‛ and was with me daily up to that point in my tour. I hardened my heart and swore that I would never let an other soldier that close, because it hurt too bad when 'stuff‛ happened. On May 11, 1969 I got my 'red badge of courage‛ and spent the next few months going from one hospital to another until I finally was discharged and sent home. I faced some of the same trials most of the returning warriors of that era did and was made to feel shame for my actions in that far away land by the war protesters and dissidents. It really upset me when comments were made that accused us of being a bunch of 'baby killers‛ and 'village burners‛ or that we had raped innocent civilians, when in fact we had administered medical aid to the villagers and cared for the sick and hungry. We had daily lived and fought with integrity and honor. Every derogatory comment seemed to dishonor Lyle’s memory. Years passed and I never sought out the family of my deceased friend. I made a couple of trips to 'The Wall‛ and etched his name on a piece of paper and stood weeping over the memories of the man that he was, but I had never felt the freedom to make the effort to tell his girls (now in their forties) or other family members how Lyle had impacted my life or how much he mattered to all those who knew him. Finally, this winter I could stand it no longer. I got on the internet and searched out the 101st Airborne’s site and then found out about the 506th Infantry’s web page. I navigated over to the section titled 'Contacting Currahees‛ on a whim and couldn’t believe my eyes. There on the first page (the fourth listing down) was an inquiry from Perry Schroeder, looking to hear from anybody who knew his brother Lyle or had served with him in Vietnam. Of course I immediately responded and began communication with Lyle’s brother Perry some 40 years after my friend's untimely death. Eventually I even got to correspond with Lyle’s daughters and was able to tell those who needed to know of his character, friendship and bravery in the midst of insanity and what was at times a living hell. This has been a life changing experience for me and has allowed me to clean out a long ignored closet from my past. This unresolved issue had plagued me for many years with guilt and regret, but now I have found a level of peace. And, along the way, I believe I have helped his family understand Lyle’s sacrifice and commitment to our nation and a band of brothers he was united with in a small troubled nation in Southeast Asia so many years ago.